While the history of the gladiators of Rome is intriguing and unique, it’s also got so many key moments that’s its hard to keep track of everything that went on. To help we have created a simple time line of the Roman gladiators, highlighting the key events and records from this unique period. We have also added in some other time lines regarding Rome to help you tie these events into the wider history of Rome, and make it clearer to see the great importance that gladiators had in the overall history of Rome. 753 BC – Rome is founded by Romulus under the name of Roma. 264 BC – The first recorded gladiator bout occurred in Rome. True to the origins of the gladiator battles this bout was in honour of the deceased. In this case, the bout was in honour of Decimus Junius Brutus Scavea, and was considered to be a private rather than public affair. 218 BC – The Roman Forum is used as a stage for the gladiators to battle accord to Livy. Wooden stands were used to allowed for more citizens to view the gladiator battles. 174 BC – The death of the general Titus Quinctius Flaminius led to the munera for him and it is reported that 74 gladiators fought in his honour. Flaminus was very popular and it’s though that this event lasted for 3 days, quite the spectacle where the gladiators were essentially the main attraction. 150 BC – The gladiator battles grow in popularity and the attendance in this periods increases dramatically. The construction of pop-up amphitheatres occurs to work with the growth in popularity. 105 BC – The first official gladiator contest occurs where the consuls of Rome, offer the gladiators from Capua in what was partially seen as a training exercise for the Roman military. 80 BC – The stone amphitheatre at Pompeii is built, but is actually called a Spectacula as the word amphitheatre is not in common use yet. 73 BC – Spartacus leads the gladiator revolt from Capua, looking to free all slaves in the Roman Empire. Along the way Spartacus and his gladiators amass a huge army that is big enough to withstand constant attacks from the Roman military. 71 BC – Spartacus is killed in battle. 65 BC – A set of Gladiator battles are held in honour of a munus from Julius Ceaser to his father who died 20 years previous. These fights were thought to total 320 gladiator battles, a huge number and a real feat of showmanship by Ceaser. 45 BC – Julius Ceaser is the first dictator of Rome and the supreme Ruler, marking the end of the Roman Republic. 44 BC – Julius Ceaser is assassinated by Marcus Brutus with the hope of returning Rome to a republic. 29 BC – The first stone amphitheatre is built in Rome by T. Statillius Taurus. 14 AD – It is now estimated that around 5 million people live in the city of Rome at this point. 64 AD – The first stone amphitheatre built by T. Statillus Taurus burned down during the great fire of this year. 71 AD – The new Roman emperor Vespasian new construction the Colosseum begins work. 79 AD – Emperor Vespasian dies before he can see the eventual completion of the Colosseum of Rome. 80 AD – The inauguration of the Roman Colosseum occurs, with Titus the son of Vespasian leading the proceedings. 108 AD – Emperor Trajan a military leader and former soldier on return from his military success in the Dacian Kingdom used what is reported to be over 10,000 gladiators over a period of 123 days of celebrations, causing future emperors like Marcus Aurelius to introduce legislation. 108-192 AD – The emperor of the time Commodus engaged in gladiator battles himself, but not without having an advantage over his opponents first. He is reported to have armed opponents with blunt or wooden weapons, and to have fought weak, injured or disabled opponents. 177 AD – Marcus Aurelius tries to introduce legislation to limit the number and time of any gladiator battle event. His son Commodus however completely ignore the legislation. 200 AD – Women are banned from fighting as gladiators, as Septimius Serverus declares is not allowed. 217 AD – The Colosseum is struck by lightning and after first starts and burns for days. 222 AD – The Colosseum is rebuilt and inaugurated again by Emperor Alexander Severus after many years of work. 401 AD – During the gladiator games arranged by Quintus Aurelius Symmachus, the Germanic prisoners refused to fight for the entertainment of the Roman crowds. Instead they strangled each other in their cells before they were due to fight. 399 AD – Emperor Honorius rules that the gladiator schools be shut down, to adhere more closely with the growing Christian religious beliefs. 404 CE – With the Christian religion taking over the Empire, and the gladiator training schools already closed, a monk from Asia actually jumped in between two gladiators fighting, and the crowd thus stoned him to death for interrupting the bout. However Emperor Honorius saw this as the final straw and put an end to gladiator battles by prohibiting them. 410 AD – The city of Rome is overcome and sacked by the invading Germanic army of the Visigoths. The Visigoths led by Alaraic I were successful where many had failed, being the first to sack Rome in 800 years. 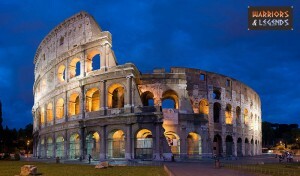 The Colosseum of Rome, the empires greatest amphitheater was also a critical point in the timeline of the gladiators. It’s quite clear to see that the time line of Rome is littered with references to the gladiators. From the first gladiator battles use to honour the dead, to the building of the mighty Colosseum in Rome. This form of gladiatorial entertainment had a large effect on Roman society and the time line of this mighty empire.